The first concrete bridge plans appeared during the industrialization of the 19th century. More proposals were to follow, but it was not until the last decades of the 20th century that the decision makers on both sides of the Sound became serious about the proposals. The Question of a fixed connection across the Sound was already discussed after the end of the Second World War at regional and national level in Sweden and Denmark. The European economy faced a new reconstruction boom. In Copenhagen and Scania they saw a fixed Sound connection as a possibility to strengthen the economic development of the region and the as Scandinavia´s natural ”gateway” to the continent. The Danish City Plan Laboratory, a society of city planners, sat down immediately after war with the politicians in Copenhagen to discuss the city´s future development of the city. The discussions ended in 1947 in the so-called ”Finger Plan”. It was an attempt to gather the expected development in well-planned frames, so they could avoid a repetition of the fast and aimless house building in Copenhagen’s bridge quarter. The future development was to be done in the form of radial infra structure lines form the city centre towards the market town ring, Køge, Roskilde, Frederikssund, Hillerød and Elsinore. Along these lines stations were to be placed like pearls on a string with houses and retail trade. The workplaces were in Copenhagen. An extended S-train net along the whole finger plan structure had the task to transport the population between home and work. As the ownership of a car became possible for more and more, the road system was extended according to the same finger plan system. The areas between the fingers were defined as green wedges, which were reserved for agriculture and forest and recreation. In practice the extensions were limited until the middle of the 1970´s to Køge Bay and the Roskilde area, as the politicians wanted to protect the North Zealand landscape from this city development. The vision of a Sound city was formulated in 1959 by professor Peter Bredsdorf and his Swedish collegue Sune Lindstrøm. The vision was drawn on a napkin in one of Copenhagen´s well-known restaurants, Brønnum´s Café. (The napkin is kept in the Danish City Plan Laboratory). On the napkin you can see the fixed connections Copenhagen/Malmø and Helsingborg7Elsinore. The coast railway and the west coast railway has been linked in the north and south to a real Sound ring line, the blood circulation of the system. Bredsdorf and Lindstrøm already then had an idea, which looked like the Finger plan, but the difference was that it reached across the Sound. Malmø/Lund and Helsingborg are not farther away from the Copenhagen centre than the towns in the market town ring. The three Scanian cities could, in each their individual way, strengthen Copenhagen as the capital. Malmø has large industries, like Kockum´s Shipyard and just 20 kilometres from Malmø is Lund with the largest university in the North. Helsingborg was and is Northwest Scania´s regional centre with extensive trade and service functions for Sweden´s contacts with Europe. Even at government level they fixed connections were drawn up in the 50´s. The Danish and Swedish governments committed themselves, at a meeting in the Nordic Council in 1953, to work for a fixed Sound connection. A Danish-Swedish government commission presented in the following 10-15 years many proposals for connections Malmø-Copenhagen and Helsingborg-Elsinore. It was the Swedes who pressed for a decision. The then Danish communication minister, Kai Lindberg, made it clear in 1962 that the decision concerning a national connection across the Great Belt had to precede the decision of an international connection. The Danes later stuck to this decision. The one thing that should prove to have a decisive influence on the placement of the Sound bridge Copenhagen-Malmø was the new projected district Ørestad in west Amager between the Copenhagen centre and the Kastrup airport. In 1962 Copenhagen elected a new Chief Burgomaster, Urban Hansen, who was elected on his promise to build houses. Urban Hansen became interested in the areas in western Amager and Amager Common, which the municipality and the state owned jointly. In 1964/65 an architectural competition was held concerning a new district in the area. The winning project presupposed a Sound Bridge, subways to the centre of Copenhagen and that Copenhagen’s airport was moved to Saltholm. The proposal contained a massive house building around a number of station areas with approximately 12.500 persons in each, linked with an efficient metropolitan and suburban electric train system. Everything according to principles, which were very similar to those, which had already been carried out in Køge Bay and Roskilde. The second price in the architectural competition went to a proposal, whose idea it was that Copenhagen should grow outwards in stages from the old medieval town to western Amager. The enclosed city Copenhagen should become an open Sound city, everything according to the vision on Bredsdorf´s and Lindstrøm´s napkin. Urban Hansen was known and notorious for his enterprise. Among the people he was called the new Christian IV. In west Amager his enterprise did not only went as far as the neighbourhood Remiseparken and the Urban Plan. All in all the building on Amager was quite modest until the end of the 80´s. Bad communication to and from the island made the politicians unwilling to develop Amager. It is interesting to note that one of the two winners of the second prize in the architectural competition was Knud E. Rasmussen (nicknamed Black Knud). He became the plan director in Copenhagen and thus a man with great influence on the designing of the Ørestad, which is sprouting up in west Amager. The Ørestad idea was already there in the 60´s. It is one of the evidence that the Sound region and is opportunities to develop Copenhagen into an economic power centre was of current interest even back then. In the favourable market conditions of the 60´s everything went along at blinding speed. The number of cars increased rapidly. The Copenhagen labour market did not only extend to the market town ring around the city, but reached far to cities like Ringsted, Næstved and Slagelse, from where people commuted every day to work in Copenhagen. In 1967 the counties and municipalities in the Copenhagen area began to discuss a revision of the Finger Plan. They wanted partly to catch up to the rapid development, partly to relate the planning to the Sound regional perspective. The plans were put forward to the public and resulted finally in ”Region Plan 1973”. Region Plan 1973 broke with the principle that the development of the area had to take place according to the Finger Plan structure with Copenhagen as the centre. A new transport corridor, with roads and railways, were to be placed across the fingers in a corridor from Køge, via Høse Tåstrup and Allerød to Elsinore. Where the corridor crossed its fingers centres for houses and businesses. The transport corridor was then to go on to Helsingborg, either north of Elsinore (Højstrup-Sofiero) or south of the city via the so-called ferry corridor. Region Plan 1973 also contained plans for a Sound Bridge from Malmø to Copenhagen via Saltholm, where a new airport was to replace Kastrup. Next to these plans the Swedish parliament (Riksdagen) passed a Sound connection for trains and cars between Helsingborg and Elsinore in 1973. The Swedish decision was never fully read in the Danish parliament (Folketinget). The Danish landslide election in 1973 came between and after that the composition of the parliament had become extremely complicated. The state’s taxation policy had become political dynamite. The result was that not only the Sound connection, but also the Great Belt connection were put in cold storage. At the same time the first oil crisis arrived with subsequent recession, unemployment and lessened traffic in roads as well as railways. Around 1980 the work to create a European home market without national obstacles had come to a halt. This was the cause of worry in the European Industry, who wanted to do better in the competition with USA and Japan. The managing director of Volvo P.G. Gyllenhammar took the initiative in 1983 to the forming of a lobby organisation, ”European Round Table of Industrialists (ERT). Members in the organisation were the top executives in by and large every large European industries, for instance Philips, Siemens, Nestlé, Unilver and Fiat. In December 1984 ERT published the report ”Missing Links”, which contained demands of among other things a Sound bridge, a connection across the Fermen Belt and a coupling of the Scandinavian railway system with the future European high-speed system. The infrastructure had to be in place, when the single market was in place. The industry had realized that its need for storage capacity for manufactured goods as well as components, demanded costs, which constituted approximately 40% of the total investments of the industry. Therefore ERT wanted to create the conditions to introduce the Japanese ”Just in time” principles for the production. This implied that the manufacturing did not take place until after the customer had ordered. This is quite demanding when it comes to the delivery of a product and all obstacles, like ferries and border passing, make up stops. Volvo made up 10% of Sweden´s export in 1983. When the Swedish government in December 1984, decided to close down the shipyard in Uddevalla, which had 2300 employees, P.G Gyllenhammar entered the discussions. He negotiated with the Swedish government and the result was that Gyllenhammar located a Volvo factory with 1000 jobs in Uddevalla and the government promised to build a 40 kilometres motorway south of Uddevalla. This was the beginning of the Scandinavian ”link” to Europe, which is described in the ERT-report ”Missing Links”, and which in reality forced the Swedish government to work for a Sound bridge and a Femern Belt connection. With this first idea in the bank P.G. Gyllenhammar started a Scandinavian version of the ERT in 1984. It was called the Scandinavian Link Consortium (Scan-Link) and had its head office in ”Dansk Industri´s ” (Danish Industry) building in Copenhagen. Scan-Link was established as a private limited company with an ownership circle consisting of 55 companies and banks in the North. The idea of Scan-Link was primarily to get the Danish and Swedish governments to build the Sound Bridge and the Femern Belt connection and to establish a cohesive motorway system and a railway system for high speed trains from Oslo, Gothenburg and Stockholm to Copenhagen and Hamburg. The Danish/Swedish government commission form the 1950´s continued to have meetings in the 60´s and 70´s to discuss possible solutions for the Sound. Their proposals became topical again in 1984-85, when Scan-Link was formed. The commission´s reports contained many different proposals. The proposals, which was considered the best from an economic point of view was a ”both and”-solution, i.e. a railway tunnel Helsingborg-Elsinore and a 4-lane motorway Copenhagen-Malmø. In 1985 the Swedish-Danish commission received new instructions. They were to evaluate the possibilities for a combined road and railway connection Malmø-Copenhagen and furthermore make economic and environment evaluations of the earlier proposals. At DSB (The Danish Railways) and SJ (The Swedish Railways) they wanted to work for a railway connection Malmø-Copenhagen. The position was shared be the Danish Social democrats. Therefore DSB began its own investigations of such a project. 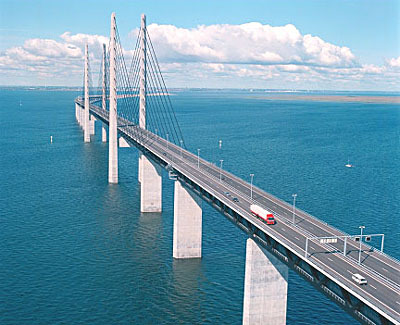 June 12th 1986 the Danish parliament decided to build the Great Belt Bridge as a road and railway bridge. With this the road was open for a Danish stand on a Sound connection. The political negotiated settlement on the Great Belt contained compensation for worried Jutland municipalities and the mayors in Korsør and Nyborg, the old ferry harbours were to be shut down, when the bridge was finished. A motorway north of Arhus was to be built and 2500 governmental jobs were to be moved from the naval station Holmen in Copenhagen to Korsør and Frederikshavn. The latter had great significance, when the decision on the Sound connection was made in 1991. In 1987 the Danish/Swedish commission published their investigations of possible Sound connections. They now recommended a combined road and railway connection Malmø-Copenhagen.The earlier proposal of a both and-solution was still there as an alternative. Especially SJ was dissatisfied with the work of the commission, as an all-railway solution had not been investigated. The commission was given the task to look solely at an all-railway solution, in comparison with the combined road-railway solution. The alternative Elsinore-Helsingborg was completely taken off the list of possibilities. The Scan-Link Consortium was now worried that the Danish/Swedish commission would arrive at all-railway connection as the best alternative. The consortium therefore initiated their own economic consequence calculation of such a railway connection. The Sound connection now began to meet popular resistance. A grass-root movement ”Scan-Link? No thanks” was formed in June 1987. The effect of this was that they prioritised investigations into the different alternatives´ environmental consequences. 1988-89 became turbulent years in the difficult decision process concerning the Sound Bridge. The political attitude to the project changed in favour of combined road and railway connection between Malmø and Copenhagen. It all started when Denmark´s economical problems was put on the political agenda by the self-appointed ”Forum for Industrial Development”, with the future Social democratic Prime Minister Poul Nyrup Rasmussen as one of the promoters. Their analyses pointed at a structure problem in Danish industry and a necessary aiming at research and a knowledge intensive development of the business community. The then Prime Minister Poul Schlüter (Conservative) did not want to leave the initiative in the question of the future development of the business community to the opposition. He arranged with the Social democratic leader to set up an ”initiative group” in the spring of 1989, which should put forward ideas and suggestions for a new strategy concerning the city-and business community development of Copenhagen. In the group were several strong Social democratic representatives like Copenhagen´s new Chief Burgomaster Jens Kramer-Mikkelsen, county mayor Per Kaalund and LO´s then vice-chairman Hans Jensen. The initiative must be seen in the light of the fact that Copenhagen had been marked by the economic crisis in the 70´s and 80´s. In this period Copenhagen saw many bankrupt companies as the government intentionally carried out a moving out of its institutions and authorities to other parts of the country, where the state also invested in infra structure. Immediately before the initiative group started its work, the Danish/Swedish government commission published their new research results in February of 1989. From an economic point of view they recommended a combined road and railway solution while an all-railway solution was considered to be the best from an environmental point of view. The financing of the combined Sound connection was proposed to function after the same principles as the Great Belt Bridge, i.e. a bridge subjected to a duty. The price was to be determined by the ticket prices in the ferry traffic between Helsingborg and Elsinore. The train operators DSB and SJ had to pay a fixed yearly duty – no matter how many trains that trafficked the bridge. With an all-railway connection DSB and SJ had to manage the financing an operation alone. This made SJ change its attitude and recommend a combined road and railway. Sj also had to consider the economic aspects. If Sj were forced to finance such a large investment and tie up huge sums in a railway connection across the Sound, they would be forced to refrain from transporting goods via the Swedish Baltic lines to Germany and Poland. DSB initially stuck to its support for an all-railway connection also for economic reasons. They counted on that they could make money on the transporting of Swedish railway goods through Denmark. The initiative group for the development of Copenhagen presented its ideas in 1989. The plans for a combined road and railway connection across the Sound was stressed, the Ørestad on west Amager and the subway between Copenhagen city and the airport made up the positive development process, which would make the wheels turn again. The group´s heavy arguments for the proposals were that Copenhagen, since the beginning of the 1970´s only had been allotted approximately 10% of the government´s traffic investments in spite the fact that 85% of the most trafficked roads were in and around Copenhagen. The EU´s single market from 1992 was also used as an argument. Copenhagen were to be prepared for the competition from other big cities – not form other Danish cities but from metropoles like Stockholm, Hamburg and Berlin. The suggestions and recommendations of the initiative group were backed up politically by the government Venstre (Liberal), Conservative and Radical Venstre (Liberal) in spite the fact the Radical Venstre strictly speaking, was against the combined road and railway connection. The fact that the proposals were taken seriously was evident when the ministry of finance in January 1990 set up the so-called Würtzen-commission, who took over the planning of the Sound bridge, the subway, Ørestad and Kastrup from the ministry of traffic. The Würtzen-commission was given the task to work out a cohesive plan for traffic investments in the Copenhagen area and the financing of them. Inspired by England´s so-called ”New Towns” the commission proposed to finance a subway from Frederiksberg via the city to Ørestad and Kastrup though the selling of land in Ørestad to industrial and housing companies. The Würtzen-commission´s plans were published in the beginning of 1991 and was received by a surprised population. The work with the extensive plans had been done without the public knowing much about what was going on. The polls showed that many were negative. December 12th 1990 Denmark had a new coalition government with Venstre and Conservatives, but without the bridge-sceptical Radical Venstre. In Sweden it looked as if the Social democrats were on their way to a defeat in the 1991 election. The possibility of a non-socialist government in Sweden with a bridge-hostile Centre Party, made the governments in Denmark and Sweden act fast. The public resistance never had time to organize before both governments in the summer of 1991 had carried the Sound Bridge. In the spring of 1992 the Danish parliament also carried the law of the establishing of Ørestaden, according to the directions of the Würtzen-commission. The spectacular future plans for the Copenhagen area made the Danish Social democrats and DSB change their minds in 1989-90. They were now positive about a combined road and railway connection. DSB´s motives were still economic, but now they no longer considered the goods transports. The development in Amager would make Kastrup an attractive traffic junction with extensive traffic to Copenhagen city, Malmø and Roskilde. The changed attitude of the Social democrats was probably due to the political lobbyism from companies like Scan-Link, but probably also the many new jobs, which they could supply for the strong Social democratic mayors in Copenhagen. The bridge decision had a peculiar epilogue in the autumn of 1993. The Danes was already then building land connections while the Swedes still discussed the environmental consequences of the bridge. The planning of the bridge had to sanctioned by the Swedish Water Court, which consisted of a judge, two engineers and two layman. In Denmark it was believed for a long time that the Water Court would stop the project. But the Water Court´s criticism of the bridge project turned out to be a part of the Swedish process and the tactics around the decided bridge building. When the Water Court said yes in the end, the bridge had already been projected. In the government agreement between Sweden and Denmark there were clauses of price parity between the bridge toll and the ferry ticket price Helsingborg-Elsinore, and that the government was to begin negotiations with Germany of a connection across the Femern Belt. The bridge toll is still debated and the Femern Belt is facing its final solution in 2003. The Danish and German governments are agreeing about the land connections in their respective countries, but they have not yet agreed of a financing model for the bridge itself, which will be a road and railway bridge.